It is unusual for a ferry ride of an approximate hour and a half to have a time difference of one hour. Crossing the Bali Strait, we reached Banyuwangi at around 4PM (5PM in Bali). 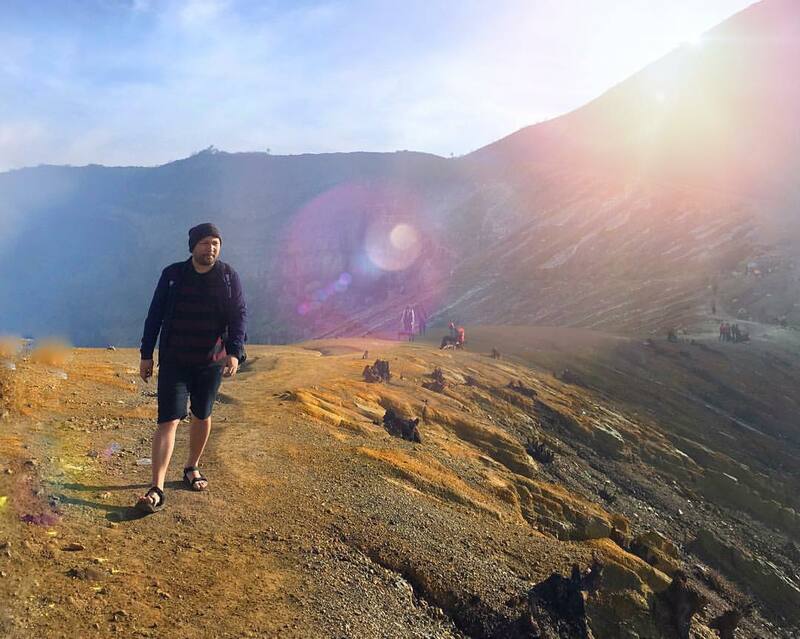 My travel buddy made the arrangements with a reliable travel agency, Ijen Blue Fire, for convenience of the trip – from hotel bookings and guide for the trek to the Ijen volcano. The closest gateway to Banyuwangi is Gilimanuk of West Bali. From our hotel in Legian, Bali, we were fetched by a pre-arranged transport from our reliable tour guide in Bali, the Bali Golden Tours. Approximate travel time from Bali to Gilimanuk is three (3) hours. But due to on-going constructions made on major thoroughfares and highways, it took us almost four and a half hours (4.5 hours). There are no trains as public transport in Bali and buses are elusive and with unreliable departure time. It would likewise be expensive to travel from Bali to Gilimanuk through a cab. Hired private transport (vans) is the best way and I highly recommend to contact Golden Bali tours, as they have friendly and English-speaking drivers/tour guides. Upon arrival at the Gilimanuk port, we purchased our ferry tickets immediately bound for Ketapang and since ferries depart every thirty (30) minutes, waiting time was not that long. Operation is likewise 24 hours so this route is recommended when going to Banyuwangi. The ferry ride is forty-five (45) minutes with ticket price of IDR6,000. It has the most basic of facilities so no expectations should be set relative to amenities and service but it definitely provided a safe trip. As arranged by the Ijen Blue Fire travel agency, we were booked at Hotel Berlian Abadi, which is just a few minutes away from the port. The hotel served as our sleeping quarters for a few hours. We will be having a midnight trek which means we have to sleep early after our early dinner. Welcome drinks and breakfast is included in our standard room with a terrace and electric fan (not air-conditioned). The hotel has a swimming pool as well and with a very few guests, we were able to meet a Spanish lady traveling solo in Banyuwangi. On the next few hours, she was with us on the trek and even on our way back to Bali. We were fetched at the hotel by a van with four (4) other guests at around 11 in the evening. I am actually not sure of where we are going and haven’t researched that much. All I know is, at the crater of this volcano blue flames are emitted. Sounds interesting of course that I did not entertain any second thoughts of not pushing through with this. I was wearing my typical jacket and shorts with sandals. At the base of the mountain, while our tour guide was doing the registration on our behalf and distributing the gas masks, I noticed everyone was dressed fully-covered. With the sudden drop of temperature of only a digit, I was uncertain if I could bear the coldness not to mention the physical activity of trekking for hours. The European guy even looked at me and say: “I will never what you are wearing now.” Is this a threat? I said to myself. I just smiled knowing that this must be a warning of how cold and strenuous at the same time the trek would be. They all came prepared after all, so they must have made intensive research. The trek to the crater is almost 3 hours – 2 hours to the rim and a descent of almost an hour to the crater lake. By 3PM, we were at the crater and since the blue flame is best seen before 4PM, everything went fast. And as for me? Fully exhausted and cold. 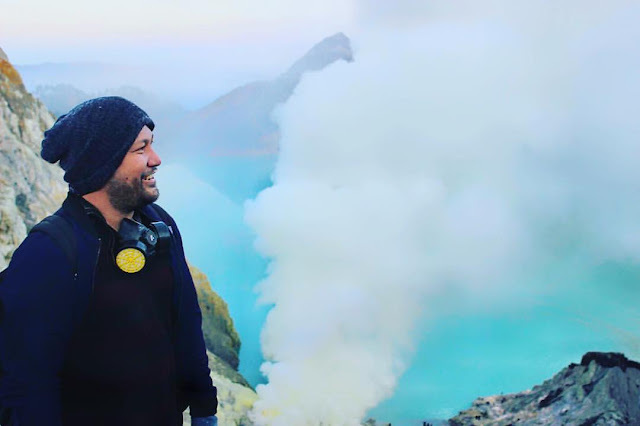 But seeing the blue flame and the morning landscape of Kawah Ijen was a surprise for me. It was simply amazing! The smell of sulfur was strong as soon as we came near the crater lake. At 3 in the morning, there was total darkness and even the path towards it – what was only visible is the blue flame emitted. This blue fire is actually an ignited sulphuric gas, which emerges from the cracks. This is considered the largest blue flame in the world. I have never seen a blue flame that close. As soon as the sun rises, the landscape became visible and rewarding. It was only during that time that I felt, the muscle leg cramps, the deprived sleep and the coldness of the midnight trek was all worth it. Before sunrise, we started our ascent to the rim. The one kilometre wide turquoise acidic crater lake revealed its panoramic landscape as soon as we reached the rim. The lake is considered the largest highly acidic crater lake in the world. In a matter of minutes before I reached the rim (since as expected I will trek on my own pace), the view was covered by clouds. While trekking, miners are likewise in action. The labor intensive mining operations continue while a lot of tourists came to witness the blue fire and the sunrise in the mountains. There are times that when tourists get photos of miners, the miners get annoyed and some ask for a small amount as remuneration of getting their photos. But these are isolated cases as most miners were actually kind and welcoming. Baskets full of sulfur were carried by these miners in an unpaved and at times slippery pavement of the mountains and for long distances. I tried to lift one fully loaded basket and it was indeed heavy that I can’t even move it an inch for more than 30 seconds. The miners earned my respect on that note. Their work place is hazardous. The walk at the rim and the view of the mountains was a good morning treat. More than the electric blue flames which was our initial purpose, the scenery was a good surprise for me. It really pays to have no expectations. I had a walk in the park descending back to the base of the mountain and more relaxed as there is no phenomenon to catch up like the blue flame. With this, I was left behind and the last one to arrive to our van. Fortunately, we had a good deal for this trip. The tour guide, David, was kind enough and accommodating to assist us on all our needs even driving us to the town center to find a place for dinner and do the last minute shop on what to wear for the trek considering that I came unprepared for this. It was an extraordinary service that we were grateful for. I have always trekked on my own pace and traveling in a group may have advantages and disadvantages. One advantage is you gain new friends and more people to take pictures of you. However, different people have different speed and fitness, which makes it more strenuous to catch up, thus, ending up in full exhaustion and pressure. The role of the tour guide is important in this case. Putting pressure to speed up the trek is good in the case of Kawah Ijen when ascending though, because the Blue Fire disappears before 5 in the morning. There is no need to invest in trail or hiking shoes, even those without climb experience can survive (I guess). I believe what is important is a comfortable and stable footwear with a good grip and everything becomes smooth, the problem will be your physical condition. In my case, I always have my reliable trekking sandals, even on cold mountains such as this. During the trek, you cannot flaunt your jewelry. The exposure to sulfur will discolor it. To be protected from sulfur gasses and especially for those who goes down the crater lake to have a close encounter with the blue fire, it is a must to have a gas mask. It would be advisable to have layered clothes that can be easily taken off and due to the low temperature, it would be best to have warm jackets. They say sulfur can be irritating to the eyes which is the reason why those wearing contact lenses are advised to take them off and wear glasses instead. However, I did wear contact lenses and it worked for me, so this may be on a case to case basis. The head lamp and the torch is definitely useful during the midnight trek. There are no lamp posts and we only relied on the directions given by the tour guide and of course the illumination of the head lamps. One thing that saved me as well from this trek is the trail food – chocolates and candies along with mineral water of course, as the trek requires a long number of hours. And of course, to preserve the memories, taking pictures is a MUST.